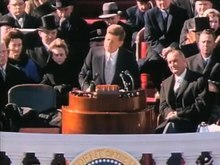 President John F. Kennedy made his only inaugural address at 12:51 (ET) Friday, January 20, 1961, immediately after taking the presidential oath of office administered by Chief Justice Earl Warren. The address took 13 minutes and 59 seconds to deliver, from the first word to the last word, making it the fourth-shortest inaugural address ever delivered. But neither can two great and powerful groups of nations take comfort from our present course–both sides overburdened by the cost of modern weapons, both rightly alarmed by the steady spread of the deadly atom, yet both racing to alter that uncertain balance of terror that stays the hand of mankind's final war. Let both sides unite to heed in all corners of the Earth the command of Isaiah to "undo the heavy burdens ... (and) let the oppressed go free." Now the trumpet summons us again; not as a call to bear arms, though arms we need; not as a call to battle, though embattled we are; but a call to bear the burden of a long twilight struggle, year in and year out, "rejoicing in hope, patient in tribulation"–a struggle against the common enemies of man: tyranny, poverty, disease and war itself. In the long history of the world, only a few generations have been granted the role of defending freedom in its hour of maximum danger. I do not shrink from this responsibility; I welcome it. I do not believe that any of us would exchange places with any other people or any other generation. The energy, the faith, the devotion which we bring to this endeavor will light our country and all who serve it–and the glow from that fire can truly light the world. This page was last edited on 7 July 2018, at 09:35.